Home / Blog / [BAW 10]: Bikini Time! This week I have something super fun! Bikinis! Which is why I’m calling March Bikini Month! Now I do have a super selfish reason for making March Bikini Month- and that’s because I’m on a family trip to Grand Cayman right now! I am writing this post with the ocean lapping at the shores – and yes it’s bliss! But I couldn’t leave you without the Bra-A-Week Challenge post this week, and I couldn’t leave for my trip without some super cute bikinis! Because they’re so quick and fun to make- and because I have a sister- I thought it would be a good idea to make more than one for the trip, then of course I got inspired and a little carried away, and ended up with 3 different styles of bottoms that I love: Bikini, BoyShort and HighWaisted! And then some tops to mix and match! So because I’m in the middle of doing some blog photography here- instead of showing you one make, I’m going to do a little preview this week, tutorial next week, and then a full showing the third week of March! Here I am doing a little beach combing in my nautical boy shorts! Getting a little hammock time in my mermaid bikini, with an accessorized bikini top. 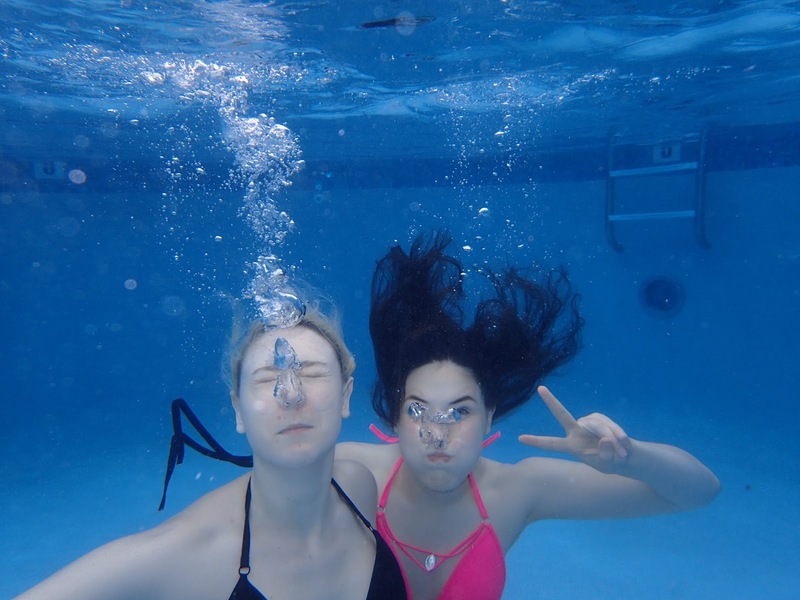 And of course I couldn’t be taking underwater shots without a little selfie fun with my sister Kristie! What are you making this month? Anybody joining me with bikinis or are you sticking with some bras? I am sooo jealous! That you are in the Caymans, that you are beachcombing and swimming, and that you look so darn cute in your bikinis!!! Enjoy your vacation! It's pretty fantastic 🙂 And I'm loving being able to just sit out in my bikini- they had to de-ice our plan when we left Toronto so this has been bliss! I can't wait to see you summer bombshell suit! There's nothing better than a bathing suit that makes you feel like a million bucks!! Perfect timing for Bikini month! I am hoping to churn out a few this month for a trip to Hawaii in April. Hope you have a great time on your vacation! Oh!! That sounds like fun, it is perfect timing too!! Jay, I'll joint you.Love your New bikini. Nice pics, enjoy your holiday!